Wednesday 03/27 Happy Birthday Kathi Reifschneider! With a continuously running clock do 5 Back Rack Stationary Lunges (BRSL) on the left leg the 1st- 30 seconds then 5 BSRL on the right leg the 2nd- 30 seconds and so on…continue to alternate legs every 30 seconds for a total of 7 minutes. No rack. LTBD. Post load and total reps to Members area. Compare to 12/19/18. 3) Dumbbell Flies on Med Ball 10-8-8-8-6 reps for load. Post reps for #1 and loads for #2-#4 to Members area. Compare to 01/25/19. *increase load for each exercise, each set. Post loads to Members area. Compare to 08/25/16. 10 sets. 30 second rests. Increase loads. *plate used for the load with weighted hip extensions. Post loads to Members area. Compare to 10/24/18. 3 Deadlifts, increase loads, establish a 3RM, if able. Compare to 04/25/16. Three rounds for total reps. 2-minute rests between rounds. The athlete will spend 1-minute at each station doing repetitions. On call of “rotate”, the athlete will move immediately to the next station. This is a 5-minute round with 2-minute rests. Post load for part A and total reps for part B to Members area. —-Rest 2 minutes between supersets. Post loads to Members area. Compare to 02/07/19. Post time to Members area. Compare to 05/12/18. Registered Athletes competing in the CrossFit OPEN will complete the WOD starting at 9:00AM. Post completion to Members area. Compare to 03/23/18. Post loads to Members area. Compare to 02/13/19. A. Deadlift 3RM. 10-minute time cap. B. Deadlift 10 sets of 10 reps @ 50% 3RM. Post time to Members area. Compare to 02/01/19. Wednesday 03/20 Happy Birthday Debby Fair! Post time to Members area. Compare to 04/11/16. 2-minute rests. Increase loads. Slow and controlled. Each group should be performed as a super-set with minimal rest between exercises but 2-minute rests between sets. Post loads to Members area. Compare to 01/16/19. Tuesday 03/19 Happy Birthday Michael Wade! Post load to Members area. Compare to 01/21/19. Post loads to Members area. Compare to 02/04/19. We had a great time and awesome turnout for our Thorpewood ruck. Thank you to Dylan for planning the route and the Thorpewood staff for allowing use of their facility. Check out our website, www.torchruck.com for upcoming events and interesting articles. Post load and total reps to Members area. Compare to 10/15/18. 5 sets. 3-minute rests. Strict movement with each exercise. Post loads to Members area. Compare to 01/29/19. Sunday 03/17 Happy Birthday Kim Vuong Le! These sisters are so much fun to have in class! Thanks girls! Post load and total time to Members area. Post total rounds/reps to Members area. Compare to 07/25/16. Kat after yesterday’s workout. How’d that feel, Kat!?! The CrossFit Games Open WOD 19.4 will be offered at 9:00AM on Saturday morning. We will offer Open Gym from 7:00AM to 8:00AM and a CrossFit WOD at 8:00AM on Saturday morning. The Tabata interval is 20 seconds of work followed by 10 seconds of rest for 8 intervals. Complete each exercise entirely before resting and moving onto the next exercise. Post total reps completed. Post total reps to Members area. Compare to 10/17/18. Thursday 03/14 Happy Birthday Rob Tuggle! 5 rounds. 1-minute at each station for total reps. 1-minute rests between rounds. Post total reps to Members area. Compare to 05/07/11. Post loads to Members area. Compare to 02/12/19. Post time to Members area. Compare to 06/18/18. A. 6 sets of the following for loads. 1-minute rests. B. 8 sets of 15 - Banded Face Pulls – 30 seconds rests. C. 6 sets of the following for loads. 1-minute rests. D. 10 sets of the following, load stays the same. 30-second rests. Post loads to Members area. Compare to 01/03/19. Dumbbell Chest Press 10-10-8-8-6-6-4-4 reps for load. Do 8 Strict Pull-ups immediately following each set of Chest Press. Post loads to Members area. Compare to 07/31/18. 2) 4 x 21’s using Dumbbells, increase loads, 2-minute rests. 3) 5 x 8 per arm Tricep Overhead Extension, 90 second rests. 4) 5 x 6 per arm Alternating Dumbbell Curl, increase loads, 90 second rests. Post time and loads to Members area. Compare to 11/21/14. Back Squats 10 sets of 10 reps. Increasing loads. Sunday 03/10 Happy Birthday Amy Waterbury and Cristi Rice! 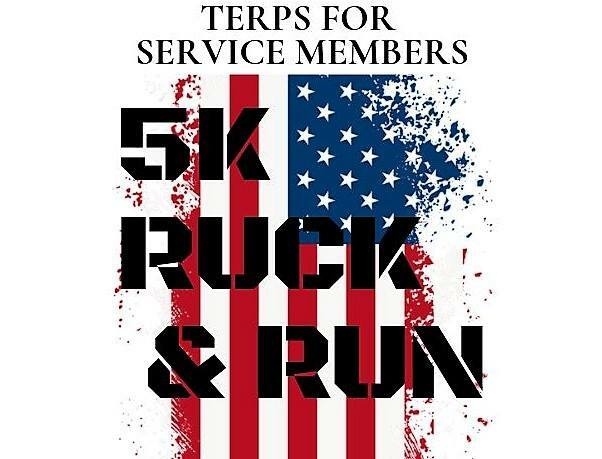 Join our TORCH Ruck Club of CrossFit Frederick for this 5K Ruck & Run event. The event will be located at the University of Maryland - McKeldin Mall. The event is on April 6th, 2019. Registration is located at the front desk of the gym for our “group” registration. If you are not a member of CrossFit Frederick, please click the image above to be redirected to our Facebook event for registration. Deadline to register at the gym is March 18th. We hope to see you on April 6th!!! Saturday 03/09 Happy Birthday Maggie Kemp! We are hosting the 5th Annual Mid-Atlantic Classic all day, starting at 8:00 am until 6:00 pm. Spectators are welcome for a $10 fee. Some chairs will be available. Beverages are available but not snacks. Please plan accordingly. Reminder: The gym is CLOSED tomorrow, Saturday, March 9th, for the 5th Annual Mid-Atlantic. Spectators are welcome for $10 each. The event is from 8:00 am until 6:00 pm. *Take a deck of cards, shuffle them, set the clock, draw one card at a time, and complete the entire deck for time.